This article is about the Hawaiian bird. For other uses, see Nene (disambiguation). The nene (Branta sandvicensis), also known as nēnē and Hawaiian goose, is a species of bird endemic to the Hawaiian Islands. The official bird of the state of Hawaiʻi, the nene is exclusively found in the wild on the islands of Oahu,  Maui, Kauaʻi, Molokai, and Hawaiʻi. The nene is a medium-sized goose at 41 cm (16 in) tall. Although they spend most of their time on the ground, they are capable of flight, with some individuals flying daily between nesting and feeding areas. Females have a mass of 1.525–2.56 kg (3.36–5.64 lb), while males average 1.695–3.05 kg (3.74–6.72 lb), 11% larger than females. Adult males have a black head and hindneck, buff cheeks and heavily furrowed neck. The neck has black and white diagonal stripes. Aside from being smaller, the female Nene is similar to the male in colouration. The adult's bill, legs and feet are black. It has soft feathers under its chin. Goslings resemble the male, but are a duller brown and with less demarcation between the colors of the head and neck, and striping and barring effects are much reduced. The nene is the world's rarest goose. It is believed that it was once common, with approximately 25,000 Hawaiian geese living in Hawaiʻi when Captain James Cook arrived in 1778. Hunting and introduced predators, such as small Asian mongooses, pigs, and cats, reduced the population to 30 birds by 1952. The species breeds well in captivity, and has been successfully re-introduced. In 2004, it was estimated that there were 800 birds in the wild, as well as 1,000 in wildfowl collections and zoos. There is concern about inbreeding due to the small initial population of birds. The nature reserve WWT Slimbridge, in England, was instrumental in the successful breeding of Hawaiian geese in captivity. Under the direction of conservationist Peter Scott, it was bred back from the brink of extinction during the 1950s for later re-introduction into the wild in Hawaiʻi. There are still Hawaiian geese at Slimbridge today. They can now be found in captivity in every WWT centre. Successful introductions include Haleakala and Piʻiholo ranches on Maui. The nene population stands at 2,500 birds. Two Hawaiian geese at the Kīlauea Point National Wildlife Refuge. Group of Hawaiian geese on the golf course of Waikoloa in April 2010. ^ BirdLife International (2012). "Branta sandvicensis". IUCN Red List of Threatened Species. Version 2014.2. International Union for Conservation of Nature. Retrieved 29 November 2014. ^ "Nene geese on Oahu for first time since 1700s". Hawaii News Now. 24 March 2014. Retrieved 25 March 2014. ^ Pukui & Elbert (2003). "Lookup of nēnē". Ulukau, the Hawaiian Electronic Library. University of Hawaiʻi. Retrieved 13 January 2010. ^ Jobling, James A. (1991). A Dictionary of Scientific Bird Names. OUP. ISBN 0 19 854634 3. ^ a b Harder, Ben (6 February 2002). "State Bird of Hawaii Unmasked as Canadian". National Geographic News. National Geographic Society. Retrieved 17 March 2009. ^ Ziegler, Alan C. (2002). Hawaiian Natural History, Ecology, and Evolution. University of Hawaiʻi Press. p. 260. ISBN 978-0-8248-2190-6. ^ a b c Reading, Richard P.; Miller, Brian (2000). Endangered animals: A Reference Guide to Conflicting Issues. Greenwood Publishing Group. pp. 142–146. ISBN 978-0-313-30816-1. ^ a b c d e f Ellis, Richard (2004). No Turning Back: The Life and Death of Animal Species. New York City: Harper Perennial. pp. 280–281. ISBN 0-06-055804-0. 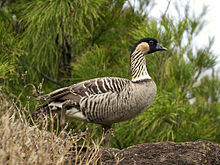 ^ a b "Nene or Hawaiian Goose" (PDF). State of Hawaiʻi. 25 March 2005. ^ Banko, Paul C.; Black, Jeffrey M.; Banko, Winston E. (1999). "Hawaiian Goose (Branta sandvicensis)". In A. Poole (ed.). Birds of North America Online. Cornell Laboratory of Ornithology. Retrieved 18 March 2009. ^ "Hawaiian Goose (Branta sandvicensis)". Audubon Watchlist. National Audubon Society. Archived from the original on 8 January 2012. Retrieved 18 March 2009. ^ "Nene Pictures Showing this Highly Endangered Goose Endemic to the Hawaiian Islands". Marine Wildlife Photography. ^ "Safe Harbor Agreement for the introduction of the nene to Piiholo Ranch, Maui" (PDF). State of Hawaii, Department of Land and Natural Resources. August 2004. Retrieved 13 January 2010. ^ Standley, Bill (August 2004). "Ranchers Advance Recovery of Rare Hawaiian Bird". Environmental Defense Fund. Archived from the original on 24 January 2011. Retrieved 13 January 2010. Wikimedia Commons has media related to Branta sandvicensis. Look up nene in Wiktionary, the free dictionary. "Hawaiian Goose media". Internet Bird Collection. Audio recordings of Nene on Xeno-canto.